Artificial neural networks (ANNs) are an example of information processing that is inspired by biological nervous systems, such as the brain, that process information. The key element of this paradigm is the novel structure of the information processing system. It consists of a large number of highly interconnected processing elements (neurons) that work together to solve specific problems. Artificial neural networks, like humans, lead by example. Configure the ANN for specific applications through the learning process, such as pattern recognition or data classification. Learning in biological systems involves adjusting the synaptic connections that exist between neurons. The same is true for artificial neural networks. Neural networks have the remarkable ability to derive meaning from complex or imprecise data and can be used to extract patterns and detect trends that are too complex to be noticed by humans or other computer technologies. A well-trained neural network can be thought of as an "expert" in the category of information it is analyzed. The expert can then be used to provide predictions and answer "hypothetical" questions given new situations of interest. Will add a position, after adding a few layers, if the market has not reversed, EA will not increase the position, waiting for callback stop loss. Time to add my review. I rented Magic Dragon one month ago and let it run live on two A$2000 accounts using a fixed lot of 0.2. During the month from 8 March 2019 there were 20 trades on each account and I have made a combined profit of A$1393. That is a return of 35% in one month. Thank you Mr Chen! But was I just lucky? 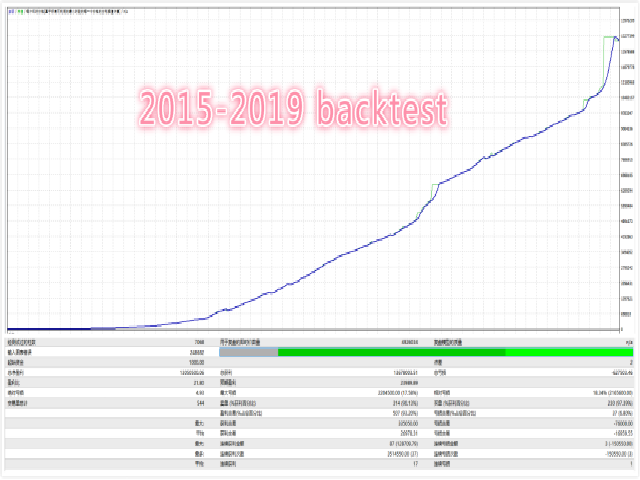 Based on my back testing from the start of 2015, Magic Dragon behaved magnificently for the first two years, then the level of risk increased. Perhaps this reflects nothing more than a change from a range-bound to a trending currency pair. But from Nov 2018 to March 2019 there were two instances of Magic Dragon building very large positions (11 lots). There did not appear to be any stop loss mechanism. I note also that one of these large positions accumulated during March 2019, making it clear that the timing of trade entries was highly relevant to the success of the outcome. In summary, I will buy Magic Dragon now that my rental has expired. But watch it closely! There are risks involved and a currency pair trending against you will see your account blown. You will need to use your discretion relating to the number of grids you can tolerate. A good EA, but it is not risk free. Four stars, but certainly worth owning. Nothing magic here, and dragons doesn't exist, it's just a komodo dragon. Another curvefitted EA. 3/14 purchase, real trading for 1 week, currently 9% profit. Praise. Follow-up reports. This so called Magic, ea, does not reflect what happens on backtest in real life. the author made the ea to show nice result and different strategy on the backtesting, but when you trade live or on demo, you will see a that total different strategy, which is totaly different from the backtest strategy, espeically, were the Take profits are placed. i therefore consider this ea to be a big scam and will blow your account, this happens in the EURUSD reccomended pair. check the comment section, for evidence of what i am talking about, guys, its a BIG SCAM!!! the author claims the ea has stoploss, while it does not have any protective stoploss. i thought this ea has a stoploss, but im sorry, it does not have a stoploss, this is bad, your whole account at big risk, i will come back and remove this one star rating, once the author fixes this. What a BIG SCAM , lier EA, author lied on his description page, this GRID EA HAS NO SINGLE PROTECTIVE STOPLOSS. The best EA ever, it's worth more, If something changes I will update this review, but now it's all very good! The support is very good as well! After 3 weeks in use i can say that every trade was a win. Good EA with low DD. Will update in 4 weeks. 10.4.2019 Update : The EA produces still Profit. I think it is one of the Best EA you can buy here on the market.